The complete IPOPP includes the Front End System (FES), the Data System (DS), and the Science Processing Algorithms (SPAs). 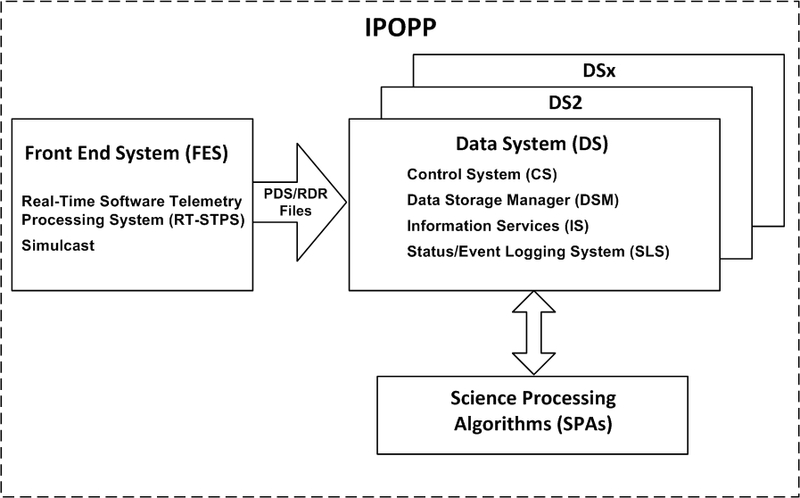 The Science Processing Algorithm (SPA) wrapper is key to the success of IPOPP. Algorithm wrappers provide a common command and execution interface to encapsulate multi-discipline, multi-mission SPAs. Virtually any processing algorithm, packaged within the DRL's unique algorithm wrapper, can be integrated easily into IPOPP or run in a standalone environment. The FES contains the software (i.e., Real-time Software Telemetry Processing System [RT-STPS]) and hardware to convert unsynchronized downlink data telemetry to SNPP instrument RDR files, or MODIS Level-0 Production Data Set (PDS) (packet file and Construction Record [CSR]) file pairs. The DS contains the Control System (CS), the Data Storage Manager (DSM), the Information Services (IS), and the Status/Event Logging System (SLS). The CS assembles the requisite input resources and schedules the execution of the SPAs. SPAs generate science data products for various instruments. A separate instance of the CS controls each algorithm. The DSM maintains a MySQL Database describing the location of data files and products, as well as metadata for the products. DSM agents move data among the various IPOPP components and store all products in the IS Data Repository. The IS maintains a static subdirectory tree, the IS Data Repository, where products and data files are stored. The IS retrieves ancillary data files from the DRL or other remote locations and places them in this subdirectory. 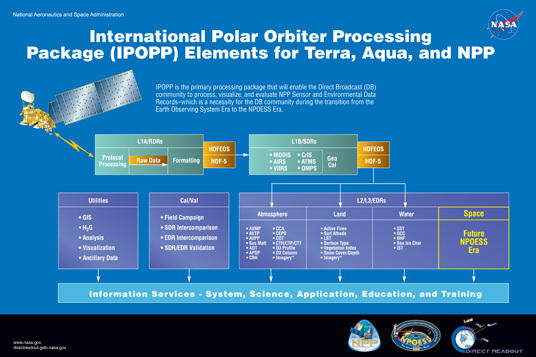 The SLS manages and displays messages logged by the IPOPP components.